The chances are, if you’re looking at content strategy in 2016, you’re at least thinking about starting a podcast. There are a few things you probably won’t learn upfront — so here’s a collection of things I’ve learned over the last couple of years. 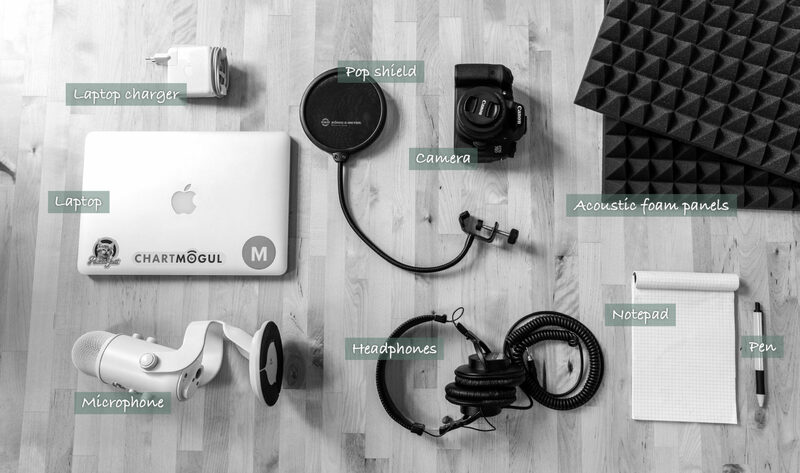 So you’re thinking of starting a podcast as a marketing channel for your business? Great! Let me share some experiences with you. Currently, I listen to about one hour of podcasts per day, during my morning routine and whenever I’m doing tasks which don’t require much brain power (e.g. washing the dishes). That’s more hours than TV or books manage to get out of me. I started experimenting with podcast product a couple of years back, and eventually started my own Berlin Startup Radio — more as an experiment than anything else. After a handful of episodes and being featured on iTunes, the show got put on hold rather quickly, as I needed more hours in the day to focus on work. Then came ChartMogul and the need for a content strategy. I saw the need to do something different in a space with so much noise and competition, and a podcast seemed like the logical choice for expanding our audience in a channel with a lot of potential. Plus, I already knew my way around the tools (more on that later). The way that podcasts work is as follows: You host your podcast somewhere (we use SoundCloud), and that host gives you an RSS feed. This is the feed that you submit to different podcast “stores”, such as iTunes. iTunes does not host your podcast. It just indexes feeds from the thousands of shows submitted to it. Where the listens are coming from: Web, iOS, Facebook embeds, etc. …that’s about it in terms of hard numbers. Not great, is it? Warning: If you use Feedburner, it’ll tell you how many subscribers you have. Don’t look at this. It’s actually an estimate based on the number of web requests to the server, and is pretty meaningless for the podcast format (more on this here). There has been some turmoil and subsequent debate in recent months over the future of the format. Apple “owns” the vast majority of the audience, through through the iTunes store and Apple’s built-in podcast app. The industry therefore relies on Apple to drive improvements to the specification that would allow for better data and monetisation options. This has resulted in some businesses creating their own walled-garden solutions, which obviously completely break the open nature of podcasts. Bottom line: You’re going to have to submit your podcast to multiple stores and marketplaces, and when promoting you’ll need to provide multiple links depending on what platform the listener uses. It’s important to remember you’re creating something that most people will listen to on-the-go, on a smartphone. Equipment and production value always come second. If you’re starting a podcast and you don’t have a compelling story to tell in the first place, don’t bother. In the same way that you can’t put lipstick on a pig, you can’t put your pig in front of a $2000 microphone with a fancy music track and expect it to sound better. There is no such thing as SEO for audio files. 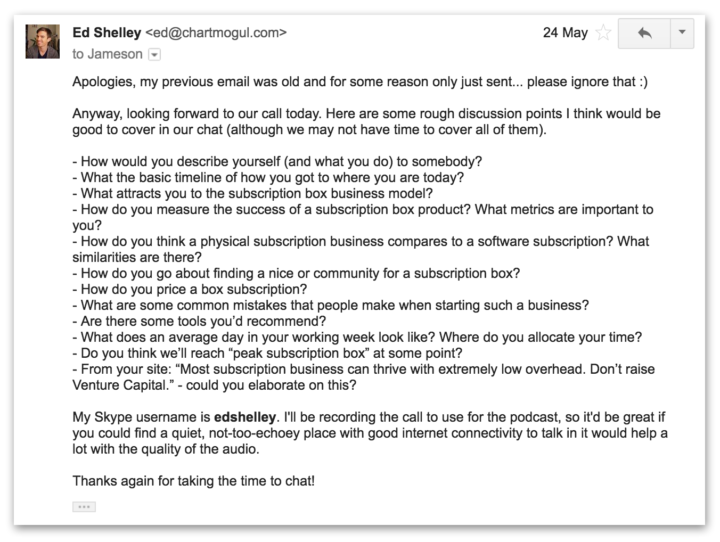 If you want to fully leverage the awesome content you’re investing in by starting a podcast, you’re going to need to get it transcribed and publish it through your usual text-based channels. Plus, some people just prefer reading! Try your best to get the show right during the recording. It’s so easy to say, “We’ll make that part sound better later” — but the reality is that the amount of time required goes up exponentially the more you decide to do in post-production. Aim for simplicity. Super important tip #1: If you’re interviewing people, the likelihood is they won’t be 100% comfortable publishing everything they’re saying. The best thing you can do is tell them they have complete “edit rights” over the outcome (i.e. they can ask to have something removed). This will let them talk much more candidly during the interview, rather than closing up because they’re worrying about what they can’t say. A decent microphone (good, not amazing). Try the Samson Meteor Mic for $60, or the Blue Yeti for $120 (I used to use the former, now I upgraded to the latter). 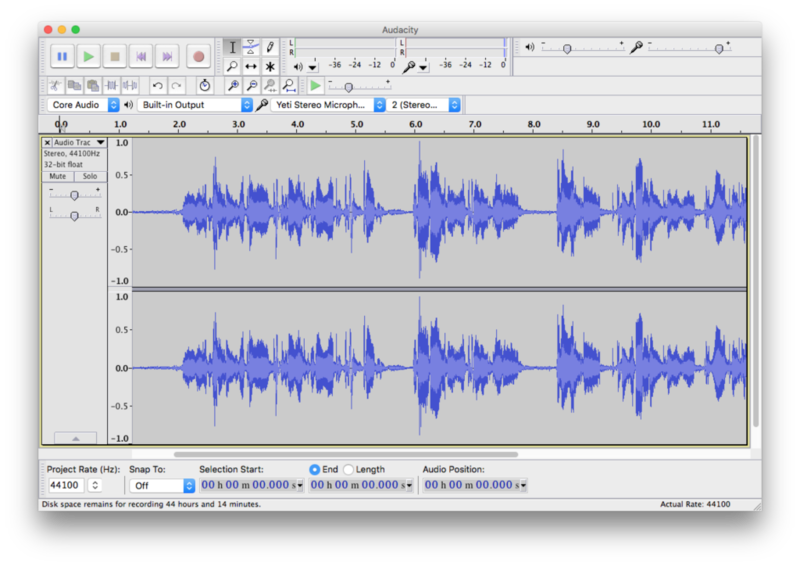 An audio editor: I use Audacity for Mac. It’s open source and good enough, despite some weird quirks. A post-production Swiss Army Knife called Auphonic that adds a compressor, normalizer and noise reduction all in one. This tool is a lifesaver! It’s even free for up to 2h of audio processing per month. Skype & ecamm’s Skype Call Recorder ($30). This plugin for Skype is amazing — it even records each person to a different stereo channel so you can later edit independently. Hosting: I use a Pro Soundcloud account. You can use the free account until you run out of free uploaded minutes. Audacity is in some ways quite clunky, but it does the job and never fails me. A 2nd microphone (especially for interviews). Acoustic foam panels, to reduce echo in the space where you’re recording. If you want to do it in true bootstrap style, sit the microphone in a large cardboard box which has been lined with these tiles (like a small recording booth). A microphone pop shield. This means you can get right up close to the mic (further eliminating echo and background noise) without nasty “pops” in the audio when you pronounce words with ‘P’ in them. Some music. The Sound Of Picture production library is great for this. They have very cheap licenses for podcast music, depending on budget. Submit to iTunes when you have those first few episodes published — you’re much more likely to get featured with a handful of episodes already in the bag. Include all of the metadata and artwork that they ask for, even the optional stuff! Submit to other stores that require submission: Stitcher, Google Play Music, Pocket Casts and any other smaller ones you like. You can find a directory of them here. When the show finally appears in iTunes (unless you fail approval), check from a podcast client to make sure everything looks good. Once in iTunes, you’ll start showing up in some other stores which pull from there. Super important tip #3: If you followed my advice from earlier and gave the interviewee full edit rights, you’ll need to give them access to a draft of the episode to review. With Soundcloud, you can upload a track and make it “private”. Then when you hit the Share button, you’ll get a secret link to the episode — send this link to your interviewee. Send some rough example questions or topics that you’d plan to cover in advance. I say rough, because you don’t want the interviewee to script answers to them. So you need just enough that they feel like they can prepare. Find the quietest room possible with the least echo. You will not be able to remove echo post-recording, and noise is fairly difficult. It’s far easier to get it right first time. Prepare your setup at least 15 mins before the call. Do a quick test recording (use the Skype call test woman for this) just to make sure everything’s working. I’ve lost parts of an interview before due to stupid mistakes, and it’s NOT cool. Take at least a couple of minutes to chat with your interviewee before you go into the recording, especially if they seem nervous. Try to minimize ‘dead’ words such as “umm”, “uhhh”, etc. Don’t be afraid of leaving a bit of silence while you gather thoughts (this is easy to edit). Let the conversation go in the direction that feels natural. If you simply stick to a pre-defined set of questions, the interview will seem rigid and you’ll never get deep into a topic (and that’s where the stories are). Ask follow-up questions to probe even more. Super important tip #4: Listen to this interview with Cal Fussman on the Tim Ferriss show podcast. You’ll gain a HUGE insight into what it takes to master the art of interviewing. The above quote applies when starting a podcast (or most creative endeavours). Your first episode will be rough around the edges. You’ll want to screw it up and toss it in the trash, to start over again. Just publish it, and move on.